For many years I have been listening to Taiko performances, a Japanese form of drumming, on CD. I find the rhythms and energy captivating. Watching live taiko performances is even better, there are many available on YouTube for those interested. Part dance and part athletics, modern taiko can be visually dazzling and acrobatically physical. Playing yourself is even better still. Earlier this year I was able to fulfill this dream by joining a group called Taiko Drum. I find that playing helps focus the mind and can be quite meditative. The latter was a surprise given the energy, action and sound involved! The Japanese art of drumming has a long history. In times past farmers beat the round taiko (drum) to simulate the sound of thunder and to encourage the spirit of rain. The sounds of animals, wind, ocean and fire were also mimicked in attempts to please or appease the gods. It is said that village boundaries were set by the distance you could hear the taiko from the village temple. Whether protecting crops, participating in a festival, visiting a temple or shrine, watching a theatre performance or fighting a battle, the sound of the taiko could be heard as part of everyday Japanese life for over a thousand years. 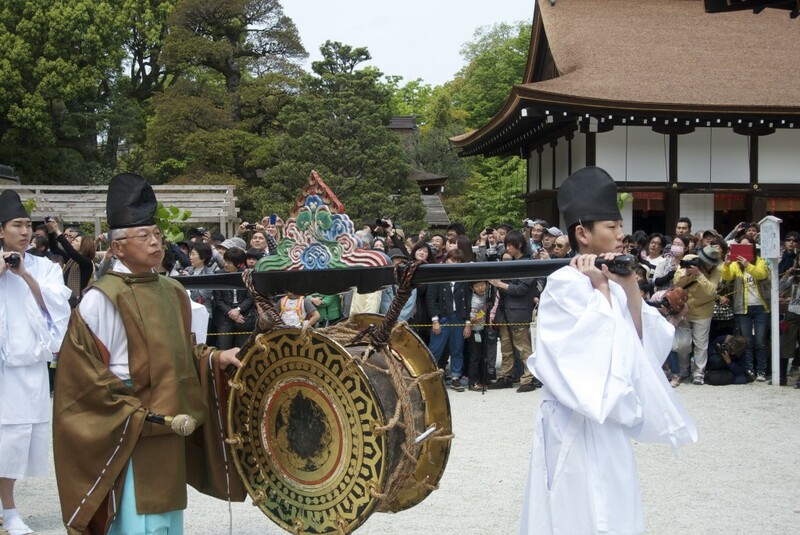 The single drum is one of the instruments used in Kagura, a form of Shinto sacred music and dance. This image is from a purification rite associated with the Aoi Festival in Kyoto, Japan – an event dating back to the sixth century. Source: Green Shinto. The taiko symbolises community in Japan. In times past farmers would take drums to the fields to drive pests from crops or awaken the spirit of rain. Taiko are still used in local community festivals today. Daihachi Oguchi, a jazz musician from Nagano Prefecture in Japan, is credited with developing the modern form of taiko – where many drums are played in an ensemble. The Hiryu Project, set up in his honour, writes that the western drum set gave Daihachi Oguchi the inspiration to form a group in which players perform on different types of taiko. Known formally as Kumi-daiko, this popular style is now in its seventh decade and has gained a following world-wide. Seiichi Tanaka, widely known as the “father of Taiko” in North America, was influential in spreading Kumi-daiko in the west. After training with Daihachi Oguchi in Japan he set up the San Francisco Taiko Dojo in 1968 at a time when taiko was not a household name. Since then Grandmaster Seiichi Tanaka has trained dozens of taiko players, many of whom have gone on to start their own groups. 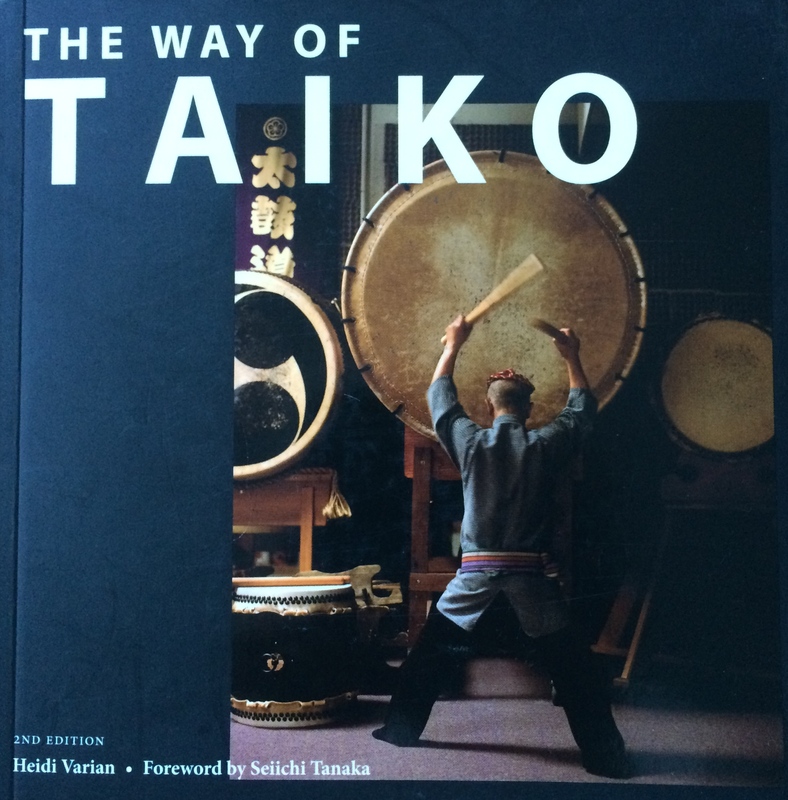 He sees the book ‘The Way of Taiko’, written by his student Heidi Varian, as an introduction to his teachings. The following text on taiko and the elements has been drawn and adapted from the second edition published in 2013. The connection between taiko and the elements is drawn and adapted from this book, published in 2013. When discussing live performances, Heidi writes that Taiko artists are representing the human connection with nature. She notes that learning the basic elements of nature and how they connect with taiko will go a long way to help performers understand the pieces they are playing. A summary of these connections follow. They represent the ideal performance, a state of presence that can take many years of training to reach. Whatever stage a performer is at, a key lesson in the book is to do the best that can be done and make every performance as perfect as possible. Earth: Taiko players are fully connected with the Earth and completely centred within themselves. As an analogy, the stance held by the player represents a mountain, the body’s grounded-ness and strength. Air: The upper body will have fluidity of motion, a sharpness of control, and the ability to rapidly change direction with force, like the wind. Fire: A good taiko performance will play with the fire-like qualities of passion, determination and power. Water: During a performance, the taiko drum itself is the container for the emotive energy that flows from the drummer like water. Spirit: Each beat will be played with full spirit, whether quiet or powerful, and have the full commitment of the player. The ultimate goal is to unify the spirit of the drummer with the spirit of the drum. For the player to be one with the drum, in time with the rhythm of the earth. Taiko in the Australian context. 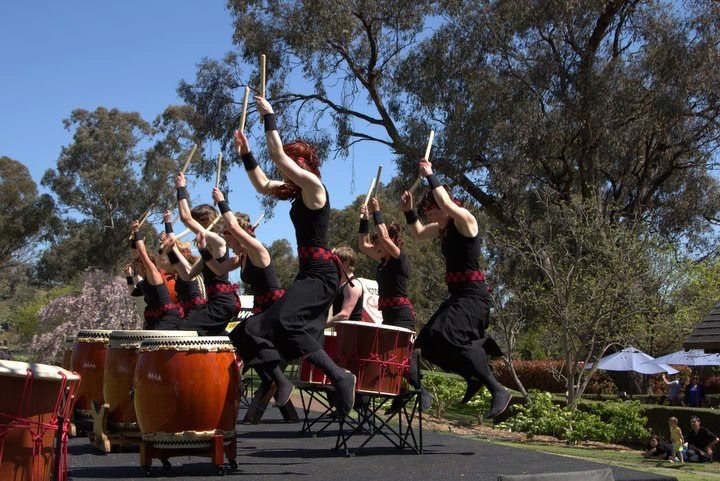 A dynamic performance by Taiko Drum in Cowra, NSW. The great photo was taken by Eric Graudins. Source: www.taikodrum.com. The titles and composition of many taiko songs also reflect the elements. These include: ‘Shiokaze’ which represents the sea breeze; ‘Furai’, the gathering and convergence of the wind from many directions; ‘Akikaze’, children chasing autumn leaves in eddies caused by the wind; and ‘Futten’ an up-tempo piece representative of water boiling and gradually gaining energy. One of the CDs I listen to is called Ibuki, which means breath. Songs like ‘Seijyaku No Wa’ (Harmony of Silence) begin with a drum roll simulating thunder, others with the sound of the wind. Of the taiko songs I’ve discovered so far, wind is the element most commonly portrayed. The air in motion converted into sound and rhythm. Of special significance is the song ‘Bruny no Kaze’, a song about the winds on Bruny Island in Tasmania written for Taiko Drum by Makoto Sekine. A professional taiko player from Tokyo, Makoto was inspired to write the song after running a workshop on Bruny Island in October 2015. Since writing this post I have had the opportunity to play ‘Hiryu Sandan Gaeshi’, the widely admired song written by the Taiko Master Daihachi Oguchi mentioned earlier. It is fun to perform, especially as it involves praying to a dragon god, one that has intimate connections to water. As my knowledge of taiko songs grows I am sure that I will discover other examples of elemental songs. Drumming and the elements connect again with the medicine wheel, used by generations of Native American tribes for ritual, health and healing. The four quadrants of the medicine wheel are associated with the 4 directions, the 4 seasons and the 4 elements of earth, air, fire (or sun) and water. Medicine wheel ceremonies include drumming, which is used in nearly every aspect of Native American culture. Black Elk, an Oglala Sioux holy man, describes the steady strong beat of the drum as the voice of the Great Spirit – a sound that helps understand the mystery and power of all things. It is often the only instrument used in sacred rites so is considered especially sacred and important. 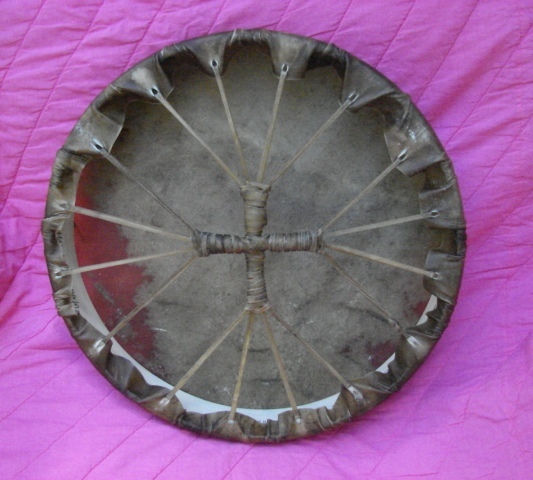 The lacing of this Native American drum is based on the 4 directions and associated elements of the Medicine Wheel. It is designed to make the drum a sacred tool. Source: sacredhoopdrums.wordpress.com. The way of the drum is part of being human, starting with the heartbeat in the womb. It is another of those connections to the elements that appear to be hard-wired. Importantly the energy that drumming generates is accessible to all, as individuals and groups. It is no wonder that drumming is found world-wide, expressed in secular and sacred form. Taiko and Native American drumming provide us with two of many examples. This entry was posted in Air, Australia, Indigenous knowledge, Japan, Performing arts, Spirit, USA and tagged Air, Drumming, earth, Energy, Fire, Japan, Shinto, Spirit, Taiko, the elements, Water. Bookmark the permalink. A life lived with the rhythm of the Earth – magnífico! Thanks Mike. They are a pleasure to write. Secret drumming. I like it! The drum in modern Shinto is compelling and calls you to another place. I would imagine there would have been links originally with the shaman’s drum, both in the context of the single drum used in festivals and ceremonies and through that the evolution into taiko. It’s possible that some of the drummers who used to play in the local villages and fields were shamans.